Bookmakers have slashed odds on Conor McGregor entering 2018’s I’m a Celebrity… Get Me Out of Here. It comes after the Irish fighter’s defeat to Khabib Nurmagomedev at UFC 229. In what was billed as the biggest fight in the 25-year history of the company, Khabib caught Conor with a strong fist early in the second round sending McGregor to the floor. The fight eventually came to an end in the fourth round when McGregor was forced into submission. What followed was almost cinematic in its lairiness. Khabib, not so content with winning the scrap, proceeded to jump out of the Octagon and into McGregor’s camp. People from Khabib’s entourage then jumped into the Octagon and swung for McGregor who had been swinging a couple of arms at another member of the Russian’s team. Anyway, naturally, McGregor is now a frontrunner for I’m a Celeb. Why wouldn’t he be? ‘McGregor’s faced a fair few snakes in UFC, so the celebrity jungle should be a breeze for the Irishman,’ a Ladbrokes spokesperson said as per the Mirror. McGregor, alongside Danny Dyer and Ronnie O’Sullivan no less, is rumoured to appearing on the ITV1 show. Odds have the fighter at odds of 4/1. It’s not as if he’s gonna be booked up. 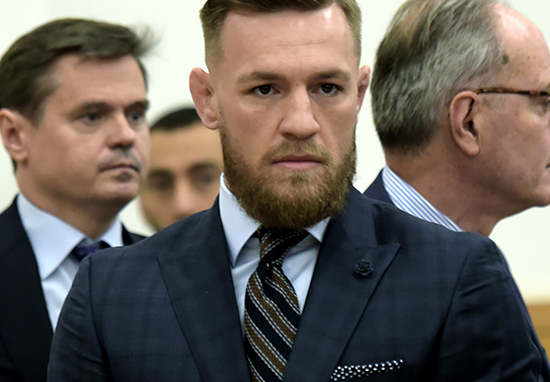 Following the furore over the weekend, McGregor has been suspended by the UFC on ‘medical grounds’. As a result he will not be allowed any contact until October 28. It was McGregor’s first fight back in the Octagon since a two-year hiatus from MMA, during which time he boxed Floyd Mayweather, losing by TKO in round 10 of their August 2017 bout. Mystic Mac returned to the UFC in a bid to once again win the lightweight strap. He first took the belt from Eddie Alvarez on November 12, 2016, but was stripped of the title during his absence from competition. Nurmagomedov would eventually become the champion after defeating Al Iaquinta for the vacant belt on April 7, 2018. McGregor’s opponent Khabib escaped suspension on medical grounds after finishing the fight relatively unscathed and passing post-match medical examinations.